INTRODUCTION: Many of the characteristics of inguinal hernia (IH) repair are especially well suited to the transgastric approach. The repair is inline with the transgastric scope vector and bilateral defects are adjacent. In addition, IH is a common operation in the younger demographic, a group that places more emphasis on cosmesis and in whom an early return to activities is paramount. Natural orifice translumenal endoscopic surgery (NOTES) has suffered from a paucity of truly innovative instrumentation. To date, the majority of reports have utilized instruments designed for endolumenal use which lack the robustness and maneuverability required for the demanding task of preperitoneal dissection needed for transabdominal preperitoneal (TAPP) IH. NOTES TAPP IH is an excellent application for advanced robotics. METHODS AND MATERIALS: Two instruments were engineered to be compatible with the daVinci surgical system (Intuitive Surgical, Sunnyvale, CA) yet have the additional length and flexibility to attach to the head of an endoscope. These novel instruments were used transgastrically for preperitoneal myopectineal orifice exposure in a non-survival canine model. 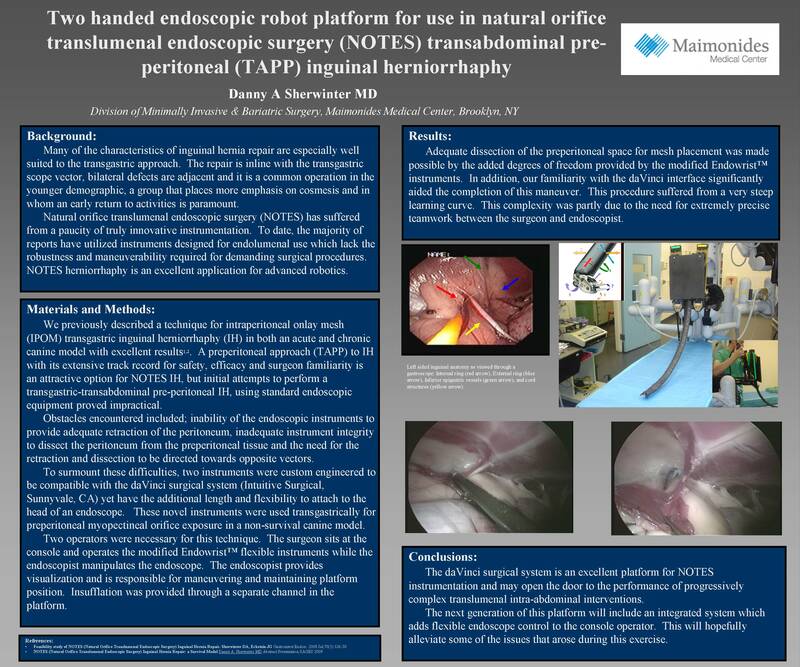 RESULTS: Adequate dissection of the preperitoneal space for mesh placement was made possible by the added degrees of freedom provided by the modified Endowrist™ instruments. In addition, our familiarity with the daVinci interface significantly aided the completion of this maneuver. CONCLUSIONS: The daVinci surgical system is an excellent platform for NOTES instrumentation and may open the door to the performance of progressively complex translumenal intra-abdominal interventions.